All I can say is... look at that picture above! That is what Emily cooked for us tonight! Yum... We had stopped at Cosco this afternoon to pick up a membership and groceries. We walked by the seafood isle and I looked up on my Monteray Seafood Watch application on my phone to see which fish was the most ecologically safe to buy and picked out some big flanks of Coho wild salmon along with some dungenous crab meat. 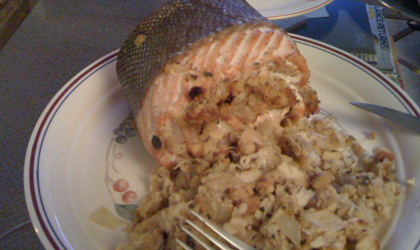 She rolled the salmon around the crab meat and baked it in the oven. It was amazing!